This site is dedicated to my hobby, Woodwork, which at present means turning in materials such as wood, acrylic, and composite. I make all sorts of items from trinket boxes to pens, (key rings to follow). I have extended the site to include images and links to guides I have authored on the Instructables web community. Just finished an article for the creation of a seasonal moneybox designed as a snowman. 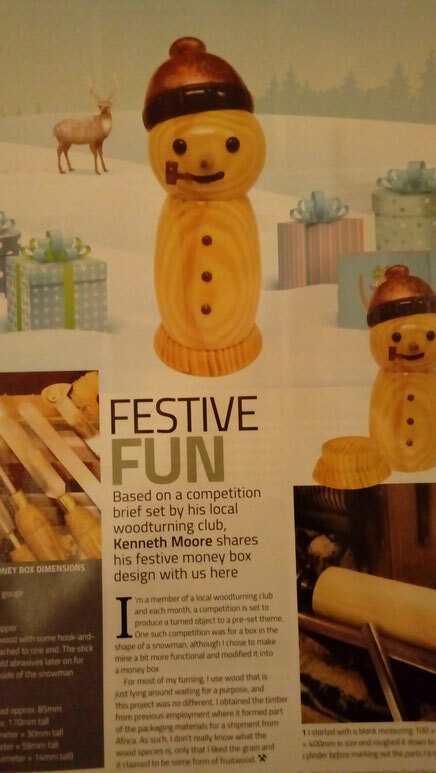 an the best part is that the woodworker magazine liked it enough to feature it in their November 2018 issue. If you like these or any of the other content on this site then please use the comments or the contact page's to let me know as well clicking on the facebook like on the home page.